What does 2016 mean to you? Perhaps it’s the year to try and secure your first home, or to move onto something new. But for many, that might feel like a pipe dream, especially for those who have been renting and struggling to simultaneously save for a deposit. However, a new year and optimism come hand-in-hand and, with a new pot of Government funding unveiled to help you out, it’s time to think again and take a fresh look at your options. Here at Stephen, increasing number of buyers are snapping up our homes for a lot less than they envisaged – not just first-time buyers but also those moving onto something new, or downsizing. Prior to the initial introduction of ‘Help to Buy (Scotland)’, securing one of our new builds was a challenge for many on the grounds of hefty deposit requirements. But the good news is that, after the last pot dried up due to demand, this popular initiative is back. At the end of January, the Scottish Government announced the next phase of the scheme which is accepting applications from 1st March 2016. They have ploughed £195M into the three-year scheme, including a Small Developer scheme of £58M for housebuilders. ‘Help to Buy’ allows people to put down a deposit of as little as 5% of the selling price, combined with a mortgage of up to 80% of the value of the property. So you pay just 85% of the property price now, and the remaining 15% is provided by the Scottish Government equity loan. Because it’s interest-free for the term of the loan, your deposit could not only be slashed, but your mortgage repayments too. What’s more. it’s not a shared ownership scheme – you will own 100% of your home. The home must also be the buyer’s only residence and cannot apply to part-exchange or buy-to-let. So, what can we potentially offer you through this scheme? You’ll be delighted to hear that one of our most sought-after developments is offering a range of properties right now which are ‘Help to Buy’ friendly. 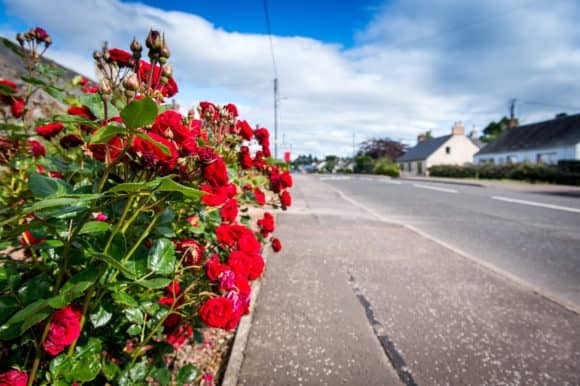 Errol, set in stunning countryside with easy access to both Perth and Dundee, offers the optimum, family lifestyle solution for many and, within our ‘West Churchfields’ development, we’ve built the houses to match. We’ve got both two and three bedroom properties available now, starting at just £159,000, all with flooring included. And, as a quick calculation, 5% of that price is under £8,000 – a significantly smaller deposit than you would otherwise require! Come and have a look – the showhome is open between 1 and 5pm, Thursday to Monday. Alternative Stephen properties, also eligible for ‘Help to Buy’, can be found within our developments in Chapelton, Guildtown, Carnock (by Dunfermline) and Pitlochry. To ensure that you don’t miss out, take a look at our website, give us a call or enjoy a trip to one of our showhomes. It’s then just a case of consulting an independent financial advisor and, any time from 1st March 2016 onwards, getting the application process moving. We will also be taking part in a free ‘Help to Buy’ open day at Perthshire Solicitors Property Centre (PSPC), 6 South St John’s Place, Perth, PH1 5SU, from 10am until 1pm on Saturday 27 February 2016. We’ll be joined by financial advisors and banks to explain what the scheme could mean for you, and to talk you through the Stephen homes which may well be within your reach. For more information, please contact our Sales office on (01738) 620721, email sales@stephen.co.uk or visit www.stephen.co.uk.